For a while now, I’ve wanted to do a series of posts where I show 3 different ways to style a key piece of clothing, it was just a matter of finding the right piece. When I got this gorgeous floral dress from Topshop a couple of weeks ago, I knew this was what I wanted to use. A floral dress is an absolute staple for me for spring summer, as it is for so many. Obviously, florals for summer is as predictable as it gets, but hey, if it ain’t broke don’t fix it, or whatever the fashion equivalent of that saying is. 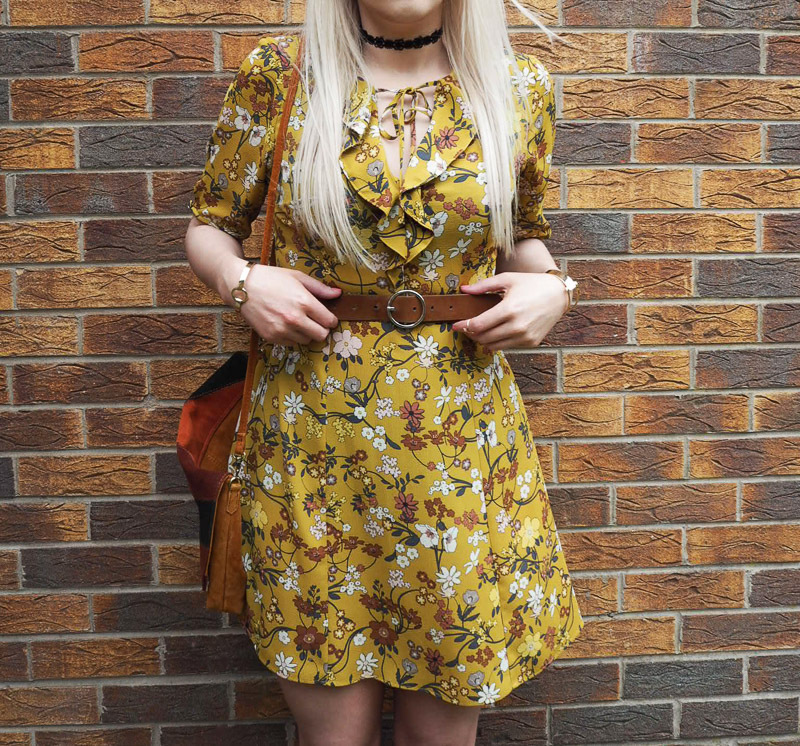 The fact that floral prints are so popular this time of year is great as it means we’re offered up a whole variety of prints, colours, shapes and styles, so it’s a guarantee that you’ll be able to find a floral dress that’s right for you. This Topshop dress is the newest addition to my floral dress collection (and I do have a fair few), and my god is it a beauty. Its official name is actually ‘Secret Garden Tea Dress’, which I thought was extremely apt and such a pretty name; a pretty name for a very pretty dress. Seeing the unusual chartreuse mustard colour and the beautiful print was love at first sight. Plus, I happen to love a tea dress. My favourite part though is the lovely ruffles at the plunging v-neckline which has a tie fastening. I actually had to sew the neckline up about an inch as it was just a little too low for me. Luckily, the ruffles act as the perfect camouflage to conceal my shockingly poor sewing skills (you would never believe I studied garment construction and sewing for 2 years as part of my degree). What I really love about floral dresses, other than the general girlishness, is that there are endless styling possibilities. There are a million different ways you can wear them to make them work for you, your style and the occasion. So, with that in mind, I’m going to show you 3 of my favourite ways to style a floral summer dress. This first look is a more on trend, original way to style a floral dress and it’s the way I personally like to wear dresses such as this. Pairing this dress with my knee high snake boots from Asos was actually the first look I thought of when I decided to do this series of posts, so I felt it was only right to feature it first. 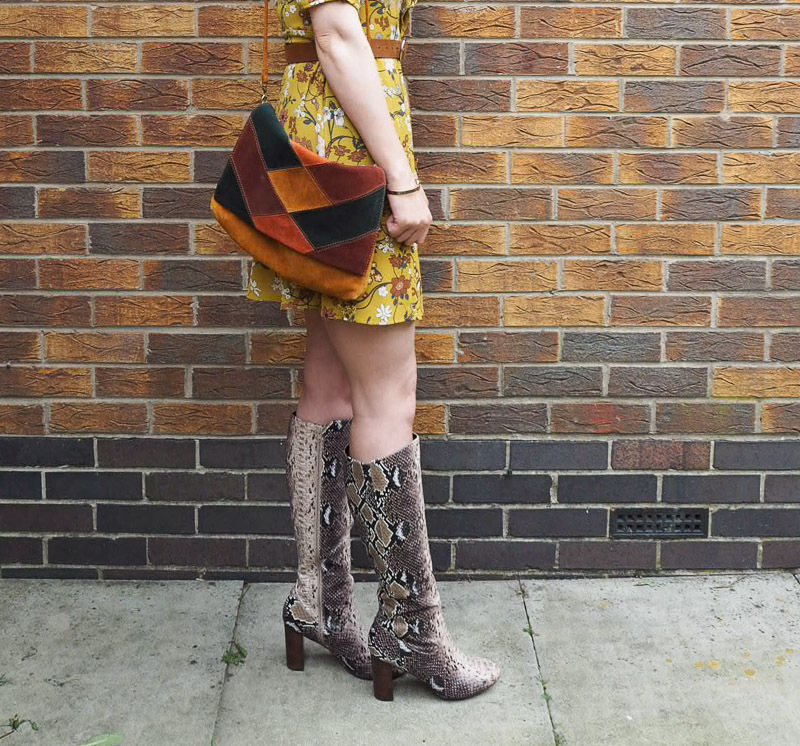 I always think these boots add some serious seventies sass to any outfit, so to take the seventies vibes even further I added my current favourite suede patchwork shoulder bag from Topshop. And of course I finished the look off with my must have accessory: a choker necklace. I love mixing different prints and styles to create a look that’s more unexpected and a little different. I definitely don’t follow rules when it comes to fashion, I just wear what I want and what I think looks good. I happen to absolutely love this outfit combination and I really hope you do too. I’m going to be posting the rest of this series later on this week. My 2nd look is going to be up on Wednesday, and the 3rd and final look will be up on Friday. If you don’t already, you can follow my blog on Bloglovin here and make sure you never miss a post. This is such a pretty dress, Katie. I love florals and like you have a few floral dresses in my collection.